Six indigenous pre-paid meters manufacturing companies on Friday said they were partnering the Ikeja Electricity Distribution Company on meter procurement and installation to customers. The News Agency of Nigeria (NAN) reports that the zone launched the Credited Advanced Payment for Metering Implementation (CAPMI) scheme in Lagos. Addressing stakeholders at the launch of the scheme in Ikeja, Mr Abiodun Ajifowobaje, Chief Executive Officer, Ikeja DISCO, said the scheme was necessary to urgently address complaints by consumers about estimated billing. Ajifowobaje explained that consumers could apply and pay for meters which would be installed within 48 hours. He said the scheme had not overridden the Multi Year Tariff Order (MYTO) introduced in June 2012. The MYTO scheme provides that no one pays for the meter as should be supplied free to consumers and paid for as tariff on monthly basis. The PHCN boss explained that due to lack of funds to procure enough meters from manufacturers at the moment, CAPMI would enable consumers obtain them by paying first and get refunded over a period of time. He said that the zone agreed to partner with the indigenous firms after many months of consultation with the Nigeria Electricity Regulatory Commission (NERC) and other relevant stakeholders in the power sector. Ajifowobaje said that the CAPMI scheme was optional and was designed for consumers who were willing to advance money to their distribution companies for speedy installation of prepaid meters. 'Customers are then refunded for the cost of the meter by way of monthly reductions on the fixed charge elements on their electricity bills over time. 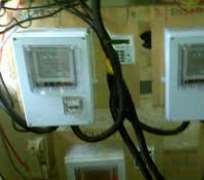 'The scheme is meant for customers to pay up-front for the purchase of the meter. 'The cost of the meter will be refunded to the customers through a billing process spread across for three years with 12 per cent interest,'' he said. He, however, said that customers would bear the cost of the accessories of the metre, while vendors with registered account with DISCO would provide 24-hour installation service to the customers. 'The amount to be paid will be publicised after discussing with the manufacturers. 'But l believe it will be within the range of N25,000 for single phase pre-paid metres and N35,000 for three phases metre. One of the metre manufacturers, the Managing Director, MOMAS System Ltd., Mr Kola Balogun, said: 'CAPMI had come to stay. 'We will make it work and it is a way to relieve consumers from the constant 'crazy bill' and estimated billing, but as a manufacturing company our aim is to key into the policy of the scheme.